Cottage close to all amenities with added bonus of off road parking. At the heart of the old fishing village of Oystermouth in Mumbles, this converted fisherman's cottage is within walking distance of shops, the sea front, beaches and a host of restaurants and cafes. A parking space is available at the rear of the property fro added convenience. The house has two bedrooms, one is a kingsize that can be set up as a twin. The other has twin beds. A travel cot is available and also a booster seat for the dining table. Everything you need is provided including bedding, towels and a fully equipped kitchen. The property has the benefit of wifi and a Smart television. Mumbles is the gateway to the Gower peninsula, 19 miles long and the first designated Area of Outstanding Natural Beauty in the UK. This makes it a perfect base for walking and other activity breaks. Closer to the cottage are three easily accessible beaches popular for family holidays. The village boasts a 12th century castle offering fabulous views from the ramparts. Mumbles Pier has an amusement arcade as well as a lifeboat house and RNLI museum. It is also possible to explore parts of Pembrokeshire in a day using the cottage as a base. Wales has had a complete coastal path for the last three years and walks can be planned east or west of the area. For example, six miles along the promenade is the city of Swansea with its many visitor attractions. Sarah retired to her home town of Swansea in 2012. Managing the cottage keep her occupied. The property is in such a convenient place, you can forget the car. There is a parking space with the property which is a premium in these small streets. Shower over the bath, toilet and vanity unit. Heated towel rail. Central heating; small electric fire. Space for one car at rear of property accessed through service lanes. Bath, hand towels and kitchen cloths. Large kitchen range with six burners. Place settings for 8. Cooking and serving dishes and a full set of cooking utensils. Door to outside and rear parking space. The table extends to seat six comfortably but is normally set up for four. There are six chairs and a raised chair for toddlers plus booster chair for babies. Smart TV with catch up facility. Decking with table and four chairs. Water sport centres in Mumbles and along the coastal path near Swansea. There are two steps to the cottage at the front. At the rear there are several steps to the back door. The area is suitable for holidays all year round. The parking space is big enough for workmen’s vans. It can be tricky getting to it due to the way people park in the lanes leading up to the space, especially if you are not used to negotiating narrow lanes. Comfortable, clean cottage, with well equipped kitchen and spacious living room. 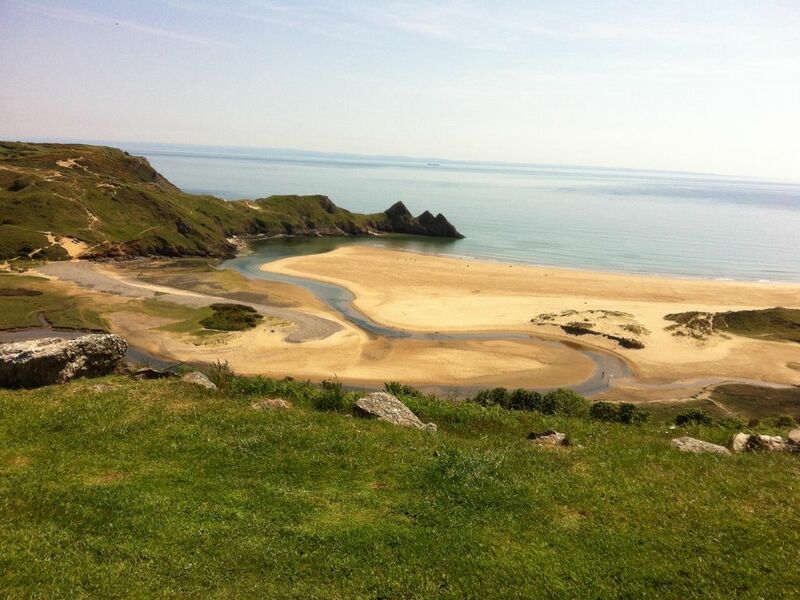 Excellent location for exploring the Gower. Relatively easy access to nearby bays and super coastal walk. Getting the car up to the rear parking space requires some skill. Better instructions for oven and central heating please. Bedside light in double bedroom not working. Wall socket loose in other bedroom. A lovely cottage in a perfect location to explore Mumbles and the area. Our young guests thoroughly enjoyed staying at the cottage which they found charming and very comfortable. An altogether positive experience. We visited for a week, me, my wife and our two grown up sons. Location is great - right in the centre of Mumbles, just a few minutes walk from the sea front, shops, bars, restaurants, etc. Walk up the hill into the woods then along to Mumbles Head and you're on the coast path. Walk down the hill and there are lots of pubs (that was the boys' request). Two bedrooms as described with hanging space and comfy beds. Fairly spacious downstairs with space to lounge with the TV or sit at the table eating (or in our case doing Airfix). Kitchen at the back is quite well kitted out. You might just want to bring your favourite sharp knife if you intend to cook. The (only) bathroom is at the back downstairs which is a little bit annoying in the night but otherwise fine. Shower works well. And the bath is welcome after trekking the Coast Path! Driving the car in and out of the parking at the back is a bit exciting the first time you try it, but we soon got used to it. The village has a 12th century castle and you can walk on the ramparts. There is a 19th century pier with boathouse and lifeboat museum. All short walking distance away.There are 73 cafes and restaurants in the area.